Figure 7.7. Conceptual scheme of a nuclear thermal rocket [Bond, 2002]. Figure 7.8. Conceptual scheme of a nuclear electric rocket. Note the mandatory radiator [Bond, 2002]. The two classes of devices represent in a way the two extreme cases of the tradeoff between thrust F and Isp. Because thrust power P ~ FVe, and Ve = Isp, at fixed power the F vs. Isp curve is a hyperbola, where NTR sits on the left, NEp on the right. The specific mission will tell whether it is better to choose an engine with high F and low Isp, or vice versa. In fact, quick escape from the gravitational attraction of planets requires large thrust; fast interplanetary travel, enabled by constant acceleration, needs very low propellant consumption to be feasible, and suggests high Isp. Any interplanetary mission includes both these trajectory segments, so ideally one would like to have a propulsion system capable of both propulsion modes. This is the motivation for the VASIMR rocket described in Section 7.22. There is a third, radical way of exploiting nuclear energy for propulsion: repeated nuclear explosions astern of a spacecraft (pulsed nuclear propulsion is a fitting name suggested by Schmidt et al. ). Hardly conceivable now, this method was proposed and investigated in the 1950s by Freeman Dyson [Dyson, 1979, 2002] and Ted Taylor, a fission bomb physicist. A concise history of this project is given in Flora ; basic propulsion aspects are discussed in Schmidt et al. . This unusual propulsion technique was suggested by the results of thermo-nuclear bomb testing on Eniwetok, when teams examining the ground in the aftermath of the explosions noticed that the graphite-coated metal spheres hung some 30 ft from ground zero were left practically unscathed. Until then it was assumed that nothing could survive a close nuclear explosion. In fact, later testing and analyses showed ablation of a plate by the intense radiative environment could protect the underlying structure. Suitably sized and reinforced, a so-called "thrust plate'' could indeed receive and survive the force due to shocked matter from the bomb and its radiation. Radiation from the fireball contributes to the force, for instance by ablating the coating deposited on the thrust plate (e.g., a polymer or grease), the momentum of the ablating products working as a rocket jet exhaust. Much of the information concerning this area of ablation and its physics is still classified today, but calculations and tests done with high explosives confirmed in 1959 the concept was viable, particularly so for massive spacecraft, that must include also a shock absorber to protect the crew. In the 1950s the nuclear test ban was not in existence, so Dyson and the physicists working on this project, called Project Orion, envisaged taking off from the ground and accelerating to orbital speeds all by sequential atomic explosions. Orion was eventually designed for a spaceship large enough to do a grand tour of the planets (as far a Saturn) lasting about one year. The mass of the spaceship for such a mission was of the order 10,000 ton. Specific impulse and thrust calculations showed both could be much higher than with chemical propulsion, in particular Isp of the order 104 to 106 s were theoretically predicted. Limitation to thrust was also due to the maximum acceleration tolerable by the crew. As there was no military application in sight, because of potential opposition by the public, and certainly that of the then Secretary of Defence McNamara, Project Orion was cancelled. 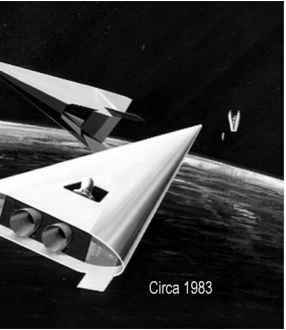 A similar concept, Project Daedalus, was the subject of a study sponsored by the British Interplanetary Society [Bond et al., 1978]. The objective was to reach Barnard's Star, 5.9 light-years away, within the working life of a human being (50 years) (see Section 8.11 for more details). A revisited Orion ("MiniMag") had been recently resurrected by replacing atomic bombs with miniature nuclear explosions; among the motivations being that of reducing the mass of the spacecraft that must host this type of propulsion. Ground testing is carried out by substituting high intensity electro-magnetic energy pulses (theta pinch-accelerated plasma jets, described in Section 8.10.2 in the context of Dense Plasma Focus devices) for nuclear mini-explosions. One of the actors in this program (partially in the open literature, see [Ewig, 2003]) is the Andrews Space and Technology company, based in Seattle, Washington. According to its chief scientist, Dr Dana Andrews [Ewig and Andrews, 2003], measured Isp was greater than 1,000 s. The thrust impulse should be substantial, unlike that of any NEP thruster, as the instantaneous power is much larger than any nuclear reactor can produce. Lack of information prevents saying more about this recent approach to pulsed nuclear propulsion except it looks suited to power long interplanetary missions, as it is capable of combining the best of the two classes NP, namely, the large thrust of NTR and the high Isp of NEP. A similar consideration holds for propulsion concepts that utilize fusion of small pellets or drops (treated in Chapter 8). As of now, nuclear-pulsed propulsion looks like it could become a major protagonist or player in future deep-space exploration.